After recent famines, accountability for starvation is back on the global agenda. At the same time, sub-national authorities who live through periods of extreme hunger are also trying to make starvation socially and legally unthinkable. In recent years, South Sudan has hit the headlines as a prime example of famine and widespread, protracted hunger. This hunger has been caused by conflicts driven by violent competition among members of the political elites. There may also be examples in South Sudan of deliberate famine, but at minimum the prolonged lack of food has been caused by political neglect and indifference. From June this year, if you visited certain Dinka villages in Gogrial (north western South Sudan), every day you would find a big crowd gathered beneath the large tree of the chiefs’ court. The crowd would gather from first light and the court would continue until the sun had nearly set. These popular court sittings were hunger courts. In 2017, there had been significant conflict in Gogrial. Many people moved to find safety away from violent clashes and threats of assassination. This forced them away from their farmland and their opportunity to cultivate. Harvest usually takes place in September, and by the next June people are often hungry as their stores of food from the previous year have run out. The interrupted harvest of 2017 meant that by June 2018, there were exceptional levels of hunger and chiefs were even reporting people dying from a lack of food. This June and in the context of growing hunger, the chiefs took the decision to suspend their normal chiefs’ courts. These courts usually hear a diverse range of cases, from adultery and divorce to theft and homicide. These cases were suspended. Instead, the only cases heard by the chiefs were those that would directly redistribute food to the hungry. Some of these cases involved demanding the quick settlement of outstanding legal claims if the claimant was hungry. Other cases involved ordering support for those who were facing starvation. In a typical example, an older brother took his younger brother to court because the younger brother was wealthy but the older brother was struggling to find enough to feed his family. The younger brother was ordered to provide two months of food to the older brother to feed the older brother’s family until harvest time. These hunger courts are not new. During famines of the 1990s in the same area, South Sudanese scholar Luka Biong had also recorded similar courts. These practices built on the long association between chiefly authority and their responsibility to provide food to the hungry. In May this year, the United Nations Security Council unanimously passed resolution 2417. This clarified that starvation of civilians during armed conflict may constitute a war crime and, therefore, be punishable through processes of international criminal law. In their normal proceedings, the chiefs’ courts often punish with fines and imprisonment. In the hunger courts in Gogrial, in cases of neglect, those who failed to provide were not confronted with explicit punitive measures. However, the discussions in the court publicly shamed them for their failure to care. This moral condemnation encouraged many to apologise and make additional, voluntary commitments to help. In the South Sudanese political system, much power rests in the hands of the politico-military elites. Yet, even these powerful figures did not have impunity from the hunger courts. In one case, a hungry widow took a senior general in her clan to court to demand support. The general did not appear in person. However, the court ordered a milking cow to be taken from his herd and given to the widow. At the same time, the courts have not been able to confront the underlying causes of hunger. The conflict that undermined the 2017 harvest in Gogrial was driven by traders and politicians competing for power and resources at the sub-national level. There was no suggestion that actors in this violent political marketplace could be held accountable by these courts. 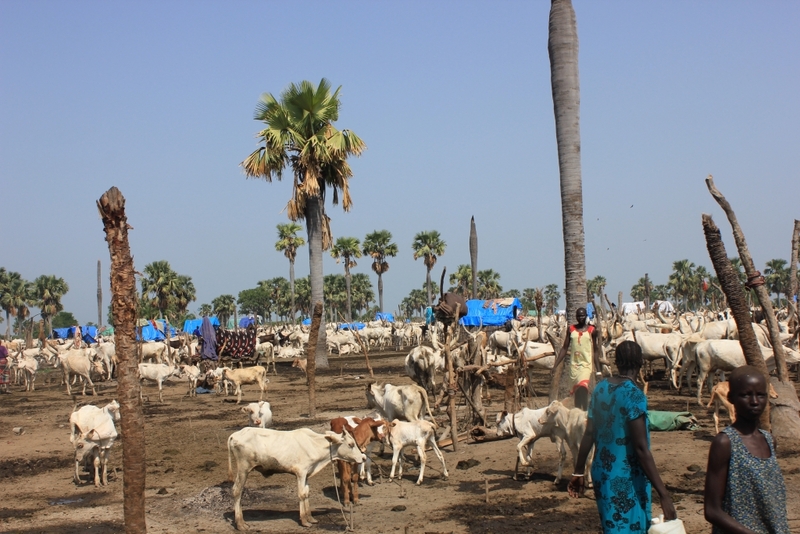 Other areas of South Sudan have also experienced extreme hunger and famine. There is more to do to understand how courts there are redistributing food, and how other South Sudanese understand the logic of accountability for hunger. As there is a growing international agenda to make famine legally and morally unthinkable, time needs to be spent learning from the logics of accountability developed by those who themselves live through extreme hunger. The featured image for this blog that appears on the homepage was taken by Naomi Pendle.